Super Bowl Sunday has undoubtedly become an unofficial holiday in the United States. Each year, millions of Americans gather in homes, bars and restaurants to watch the biggest football game of the season. Many have been known to place a wager or two on the action, but not everyone is trying to pick the winner or loser. Super Bowl prop bets have exploded in popularity, especially in recent years. Many of these bets have drawn mainstream attention on television and online because of their fun and sometimes wild and wacky nature. “Prop” is short for proposition. Instead of trying to predict the final outcome of the game, you attempt to predict whether or not certain things will happen throughout the course of the game. Some Super Bowl prop bets involve the pregame and postgame festivities and have nothing to do with the game itself. With a Super Bowl prop bets pool, everyone in attendance will have a vested interest in every single play of the game. Even those who have little to no interest in football will be rooting like they have been lifelong fans! 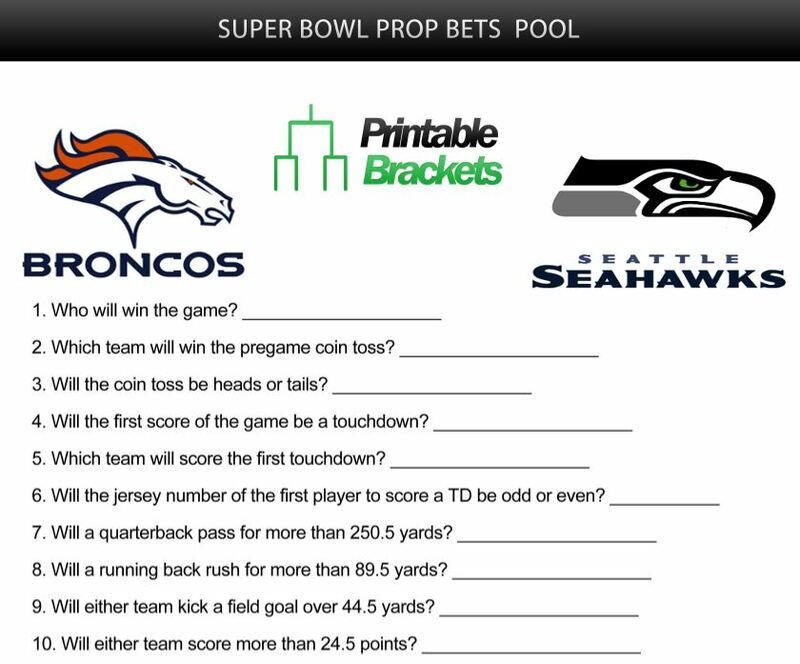 You can get your own Super Bowl prop bets prediction contest sheet for free right here! Note: This information is for entertainment purposes only. There are a number of traditional Super Bowl prop bets that have been around for decades. The most common and popular prop bet involves the coin toss before the big game. The question is as easy as it gets, as you will simply select whether the coin will land on heads or tails. The coin toss also has other bets attached to it, such as which team will win the toss and whether the winning team to will elect to receive or defer the opening kickoff. • Will a quarterback pass for more than 250.5 yards? • Will a running back rush for more than 99.5? • Will either team score more than 27.5 points? • Will either team kick a field goal over 44.5 yards? • Will the total number of points be over or under 48.5? These questions can be answered by themselves or as part of a Super Bowl prop bets prediction pool. There are literally hundreds of these types of props available for bettors online and in sportsbooks, but pools will likely only include a handful of questions. Not all Super Bowl prop bets are based on stats, but the vast majority of them involve numbers. Some of the most popular prop bets are based around who will score the first touchdown of the game. In addition to picking the player, team or type of touchdown, bettors have the option of wagering on the jersey number of the first man to score. Similar to the aforementioned total questions, bettors are asked whether the player’s number will be over or under a predetermined number. For example, the jersey number for the first player to score a touchdown in Super Bowl XLVI between the New York Giants and New England Patriots was 80.5. The first touchdown was recorded by Giants wide receiver Victor Cruz, who wears number 80. If you had the under, you won by half a jersey number! Another of the popular Super Bowl prop bets revolves around the game’s Most Valuable Player. In addition to trying to correctly predict who the MVP will be, players are given the option to predict who the MVP will thank first during his postgame speech. The most popular options available are God, family or teammates. As crazy as it may sound, predicting the color of Gatorade that will be dumped on the winning head coach after the game is a wildly popular bet. Procedural events such as which team will commit the first penalty, which coach will throw the first challenge flag and whether or not the coach will win the challenge are other very popular Super Bowl prop bets. As the game grew in recognition over the decades, the popularity of exotic Super Bowl prop bets grew along with it. For example, bettors have been asked to predict which team President Barack Obama will pick to win during his annual pregame interview. Before Super Bowl XLVI, Obama declined to make a pick, which was also an option. Another popular pregame Super Bowl prop bet involves the National Anthem. Fans are asked whether the performer will go over or under a predetermined amount of time to complete the “Star Spangled Banner.” Prior to Super Bowl XLV in 2011, pop star Christina Aguilera flubbed the lyrics of the anthem. The faux pas forced some gambling outlets to refund all wagers. Super Bowl prop bets involving the entertainment certainly don’t stop there. Prognosticators are given the option to guess exactly what the person that sings the National Anthem will be wearing during the performance. Exotic Super Bowl prop bets abound during the halftime show. Depending on the performer, options like outfit choices and which songs will be played are available. Depending on the location of the big game and the teams that are involved, there are bets regarding how many times a famous wife, family member or other celebrity will be shown on television during the broadcast. There’s no exact science to winning your Super Bowl prop bets contest. However, there’s plenty of research you can do before making your selections. You can always factor in things like past individual performances and series history when making statistical predictions. Some of the popular Super Bowl prop bets are based more on luck and fun. Since 2000, eight of the 13 Super Bowls through XLVI have been decided by a touchdown or less, meaning there’s a pretty good chance of the game living up to the hype. If you unfortunately get stuck with a clunker (see Super Bowl XXXVII), a good time can still be had by all with a Super Bowl prop bets contest!